“But he was speaking of the temple of his body” (John 2:21). The religious people that day did not get that. They didn’t understand that he was talking about the temple of his body because they were about business as usual. 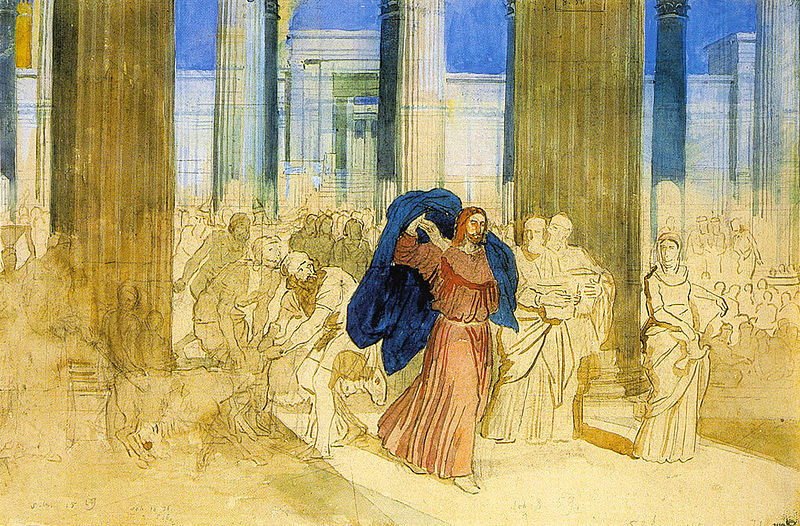 It was business as usual that day Jesus showed up at the temple. Animals were being bought and sold. Coins were being changed. All the usual people had their usual places and usual roles. This is one of those stories that we need to set aside a couple of things, things don’t belong, things that distract, before we can really understand what is happening. We need to set aside what we have often been told or thought this story is about so we can hear it again, maybe for the first time. I don’t think this story is simply about Jesus getting angry. Jesus got angry. I get angry. It’s ok to get angry. That misses the point. There’s more to this story than that. And I don’t think it’s about the animals or the moneychangers being in the temple. Jesus surely had to have known they were there. He grew up as a faithful Jew going to the temple. He didn’t show up this day and say, “Wow! There are animals and moneychangers here. I didn’t know this. This is wrong.” The animals and moneychangers had always been there. That’s how the system worked. It was business as usual for them to be there. I think Jesus went to the temple that day for one purpose; to throw out and overturn business as usual. There are times when we need the tables of our life overturned and the animals thrown out. It’s just so easy to fall into the trap of business as usual. Have you ever pushed the auto-pilot button and life became mechanical? You go through the motions. You show up but you’re not really there. That’s business as usual. How about this? Have you ever smiled that I’m-good-and-everything-is-fine smile but behind the smile there was an emptiness, you felt hollow, and your heart was breaking? That’s carrying on with business as usual. Or maybe you wake up in the morning and you are as exhausted as you were when you went to bed the night before. Business as usual. Have you ever felt like you were just not yourself? Nothing seemed right? Boredom overcame creativity. There was no enthusiasm, wonder, or imagination. It was just business as usual. Sometimes we look at life and the world and it all seems in vain. We’re busy but not really getting anywhere. There’s no depth or meaning, only business as usual. Business as usual can happen anywhere: in friendships, marriages, parenting, work, church. The things I just described are not, however, the problem. They are the symptom in the same way that the animals and moneychangers in the temple are not the problem. They are the symptoms of something deeper going on. The problem is not so much in the temple as it is in the human heart. That deeper issue is, I think, what gives rise to business as usual. Sometimes it’s about our fear. We’re fearful about what is happening in our life or the uncertainty of the future and we want some type of security and predictability so we can keep on dong the same old things. Business as usual is predictable and steady but it creates only the illusion of security. Sometimes business as usual is a symptom of our grief and sorrow. Something has been lost. We can’t get back the life we want so we cling to business as usual because it’s familiar and we want some stability. Other times we are so busy and worn out making a living that life turns into one task after another, one appointment after another, a never ending to do list, and it’s business as usual. Maybe we’ve taken people, relationship, and things for granted. Maybe we’ve lost our sense of gratitude, wonder, or mystery. I do not say any of that as a criticism or judgment of you, me, or anyone else. I’m just naming what often happens to us. What has business as usual looked like in your life? In what ways is it business as usual for you today? There are thousands of reasons and ways in which we fall into business as usual. There’s one thing, however, that I keep coming back to. Forgetfulness. Business as usual is born of forgetfulness. We forget that we really are the temple of God’s presence. We forget that all of creation is the residence of God. We forget that in whatever direction we might turn, there is the face of God gazing upon us. And as soon as we forget those things about ourselves, each other, or the world, life becomes business as usual. I think that’s what happened in the temple. They didn’t see themselves or one another as the true temple of God. It was all about the human built temple, the animals, and the coins. They had forgotten that God was more interested in them than in their festivals and that God wanted them more than their offerings. When we forget that we are the temple of God life can easily become a series of transactions. Relationships and intimacy are lost. Priorities get rearranged. Making a living replaces living a life. Life becomes a marketplace rather than a place for meeting the holy in ourselves and one another. And it’s business as usual. That’s what Jesus is overturning and driving out of the temple. In the gospel according to St. John this happens at the very beginning of Jesus ministry. The Word became flesh (John 1:14), water became wine (John 2:9), and now the temple is becoming human. And it does not stop here. Throughout the rest of the gospel Jesus will be interrupting business as usual. Remember the Samaritan women at the well (John 4:4-26)? She’s had five husbands and she’s living with a man who is not her husband. Despite what we have done to her, that’s not a statement about her. It’s another manifestation of business as usual. Her first husband died, divorced her, or ran off. Who knows? What we do know is that is was improper and dangerous to be women without a man. Business as usual meant she had to belong to a man. So there was a second man, and a third, and a fourth, and a fifth, and a sixth. Jesus meets this women at the well and interrupts business as usual. It’s not about the man or men in her life. It’s about her. Jesus recognizes her as the temple of God. It’s neither on this Samaritan mountain nor in Jerusalem. She is now the well of living water. How about the man that spent thirty-eight years on a mat (John 5:1-9)? He was paralyzed and always trying to get into that pool of water that would heal him but someone always got there first. The same ground, the same mat, the same paralyzed legs, the same failed effort. It was thirty-eight years of business and usual. Then Jesus comes and says, “Stand up, take your mat and walk.” And the man did. He rose up to a new life and business as usual had again been interrupted. And let’s not forget the five thousand people that show up empty and hungry (John 6:1-13). Philip is sure there’s not enough. There’s no way to feed them. Empty and hungry people are business as usual. But Jesus has other plans. Two fish and five loaves are more than enough. Everyone was satisfied and twelve baskets were filled with leftovers. It was not business as usual for the empty and hungry. Over and over again Jesus is interrupting, disrupting, overturning, and throwing out business as usual. Business as usual is destructive of our lives and relationships. It destroys our ability see and participate in the holy that is already present in and among us. The Word became flesh so that the temple might become human. Jesus continues to overturn and throw out business as usual because the truth is there are still Samaritan women waiting at the well in our world today. There are still lame people grounded by business as usual. Empty and hungry people are still a reality in our world and there are dead people waiting to be made alive. Maybe for you today this isn’t about other people. Maybe you are the women at the well. Maybe you know what it’s like to be grounded and paralyzed. Maybe you are empty and hungry today. Maybe you need to be called to life. Maybe business as usual needs to be interrupted in your life. Regardless of who we are, what we’ve done or left undone, or how we see or judge our life, we are the temple of God and there is one who stands in the temple of our life interrupting business as usual. So tell me this. What does the temple of your life need today? What tables in your life need to be overturned? What animals need to be driven out? I am not asking about what needs to happen so that you can become holy or become the temple, but so you can see that you already are the temple and claim what is already yours. Jesus does not make us into something we were not. He calls us back to who we’ve always been. He was speaking of the temple of our body. Thank you! You’ve given me much food for thought, and the answer to what has been bothering me. Carol, thanks for letting me know this. I am always glad to hear that sermon has been helpful. May God’s peace and blessing be with you. It is never “business as usual,”Fr Mike, when I read your sermons. Though we may never meet, you know me because you understand the human heart and soul. It is enough to know that someone knows. Your words welcome me because they are rich with all the realities I live in. You walk with me and teach me what matters. Elizabeth, yes, there is a knowing and being known that goes beyond meeting. Thank you for that reminder. I am grateful to share this journey with you and to have you as a companion on the way. This sermon shows how many different ways we get into our own ruts, patterns and habits that keep us from moving forward. Yes, Jeri, it happens in so many ways and often before we know it. It’s sneaky and often easier getting into the ruts than out of them.